Stash is the debut novel by David Klein and I was simply amazed that this is his first published work….it is polished and immediately drew me into the story. In fact, I always hate to use the words, “I couldn’t put it down” but that’s the truth. I typically read several novels at one time but from the moment I started reading Stash, I couldn’t focus on any other book until I read the last page. The main character, Gwen is a married mom in her thirties who lives in suburbia and has a seemingly idyllic life. 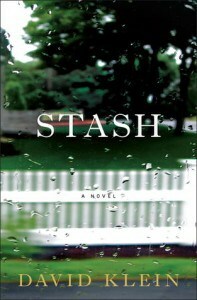 When she meets up with an ex-lover to pick up a bag of marijuana to relax before a weekend away with her family, events are set into motion which ultimately change the lives of all of the characters in Stash. The characters are very well developed and the sub plots are just as fascinating as the main storyline. In one sub plot Gwen’s husband is a pharmaceutical company executive and is embroiled in a possible scandal involving a weight loss drug that he is in charge of marketing. The novel intertwines components of a drama and a thriller into one very satisfying story by incorporating interesting elements of the drug trade and the pharmaceutical industry. What really made this novel stand out to me is that it is set in the “real world” involving a stay at home mom with an outwardly “perfect” life and marriage as well as the perspectives of her husband, her ex-boyfriend (drug dealer) and his daughter and even the investigating police officer. I really enjoyed that the author gives the perspective of each character and is an examination of the human condition. In fact the rawness of the character’s flaws is what keeps this book so intriguing and makes it so believable. I thoroughly enjoyed reading Stash and I highly recommend it to anyone who enjoys a fast paced drama and thriller that will keep you wanting more….. I am eagerly awaiting David Klein’s second novel and will put it at the top of my reading list. You’re so right, looks can be deceiving especially behind the front door. If characters didn’t have flaws it would be a very vanilla world indeed. I enjoy reading about how situations happened, the backstory and what each person does to help or hinder solving the mystery. Accurate review of a book I want to have.